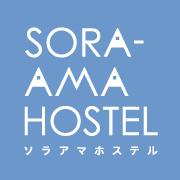 SORA-AMA HOSTEL is a hostel which has started in August 2016, right in the heart of Takayama. 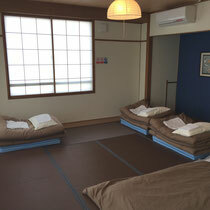 We have a mixed dormitory room and also Japanese-style private rooms. We are conveniently located along the street which directly connects JR station or bus terminal and Old Town. Only a 3-minute walk to JR Takayama station and bus terminal, and a 5-minute walk to Old Town area. Around our hostel, there are many shops, restaurants, pubs and services (laundry, post office, money exchange, luggage delivery etc.). During your stay at our hostel, you'd fully enjoy Takayama and also excursions from Takayama, such as Shirakawa-go, Kamikochi, Shin-hotaka, Hida-furukawa, Gero etc. 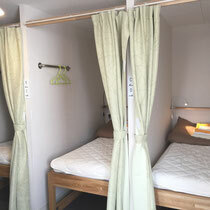 In the mixed-dormitory, we have two types of comfy beds, bunk beds (capsule type) and single beds. The dormitory room has seating areas (counter tables and stools) along with its windows which have city view with mountains. Fast Wi-Fi is available throughout the floor. 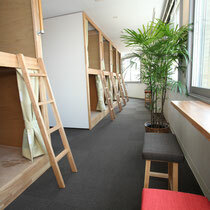 People who are older than 13 years old can stay in the dormitory. 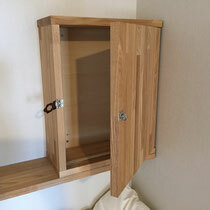 Bunk beds are wooden capsule style. Surrounded by walls at your head and sides, and by curtain at your foot end, you can shut yourself off from other guests and keep your privacy. 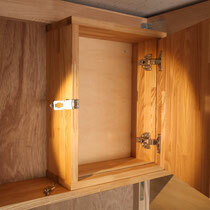 Each bed has laptop-size safe box, LED light, plug-in and ventilation fan. Your space is a width of 1.1 m, a length of 2.1 m and a height of 1.1 m.
Single beds are also surrounded by walls at your head and sides, and by curtain at your foot end, so you can shut yourself off from the room and keep your privacy. Each bed has safe box, LED light and plug-in. Big luggage such as a suitcase can be stored below your beds during your stay. For mattress, coil mattress is used for single beds for your comfortable sleep. 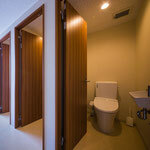 As facilities on the 3rd floor, we have an internet PC, shared kitchen and dining space, shower rooms, and restrooms. Also, a washing machine, a dryer and a vending machine are on the same floor. In the kitchen, a refrigerator, an induction cooker, a wave, a toaster, a kettle, cookwares, table wares and seasonings etc. are available. Shower rooms are equipped with body soap, shampoo and conditioner for free, and restrooms are equipped with rear washing function. Everything you will need in hostel is reachable on the same floor. For the guests of the dormitory, we provide a bath towel, bed sheets, ear plugs for free. 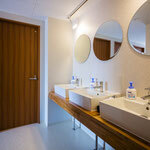 On the 4th floor, we have two types of Japanese style rooms (Superior Japanese Room and Standard Japanese Room) with shared shower rooms and restrooms. Each room has city view with mountains behind it. Wi-Fi is available throughout the floor. 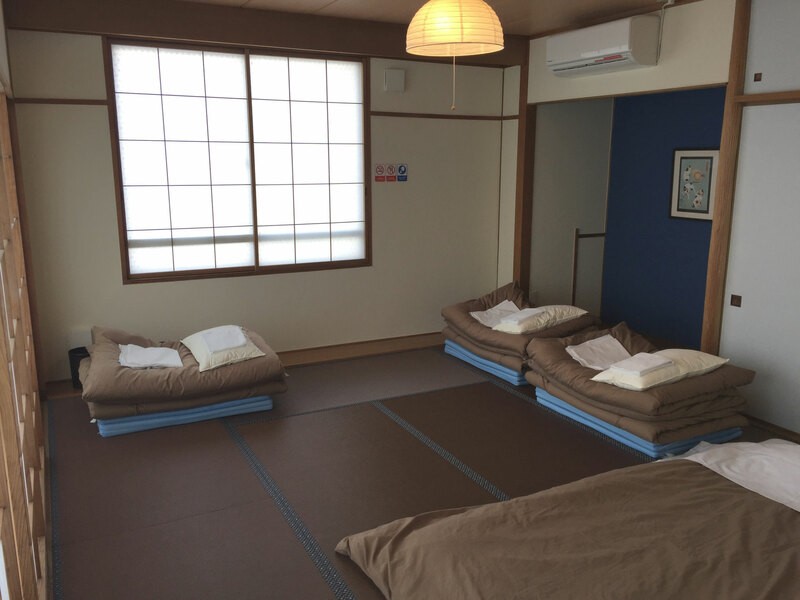 No age restriction for the Japanese style rooms. 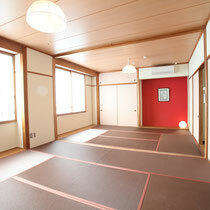 This is a large Japanese style room of 14 tatami-mat size, good for a group up to 7 people. 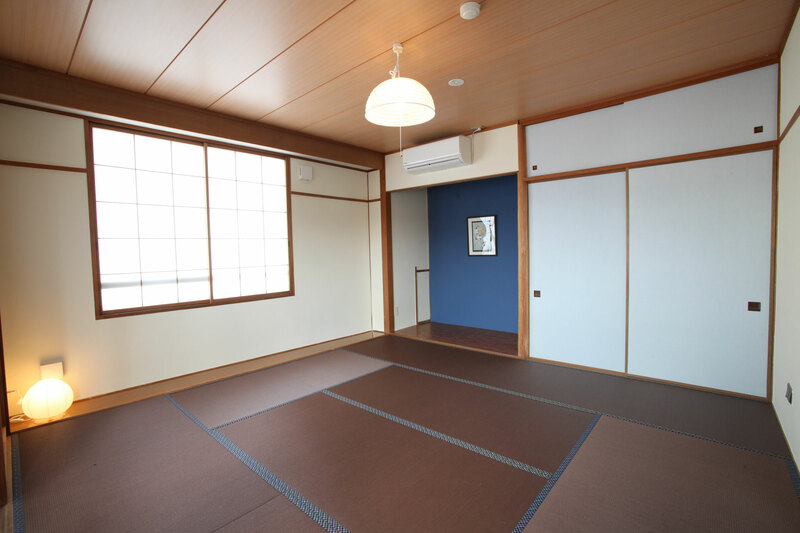 We provide futons (Japanese bedding) for this room. With futon, you can sleep on a floor, on a Japanese futon. 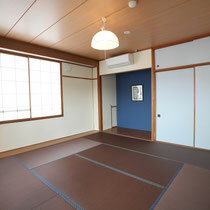 This is Japanese style room of 8 tatami-mat size, good for a group up to 4 people. 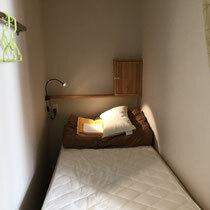 We provide futons (Japanese bedding) for this room. 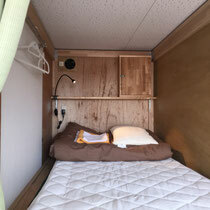 With futon, you can sleep on a floor, on a Japanese futon. As facilities on the 4th floor, we have a shared kitchen and dining space, shower rooms, restrooms exclusively for the guests on this floor. In the kitchen, a refrigerator, an induction cooker, a wave, a toaster, a kettle, cookwares, table wares and seasonings etc. are available. Shower rooms are equipped with body soap, shampoo and conditioner for free, and restrooms are equipped with rear washing function. 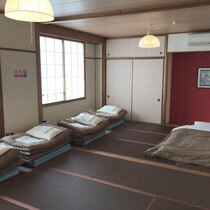 For the guests of the Japanese style rooms, we provide a bath towel and bed sheets for free. 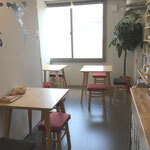 SORA-AMA HOSTEL is located a 3-minute walk from Takayama Station or Bus Terminal. From the ticket gate of the station, go to East Exit (Norikura Gate). From East Exit, go straight and cross the first street. You'll find a tiled street (Ekimae Chuo Street). Go straight on this street. After a 3-minute walk, you'll find a 4-storied yellow-brownish tiled building on your right on the corner of route 158. The building has blue-colored signboard of SORA-AMA HOSTEL. Go up stairs to the third floor of the building for the reception of SORA-AMA HOSTEL. Free and fast Wi-Fi throughout the hostel. ✓PC Available on 3F for free. ✓Laundry 24-hour available. 300 yen for washing and 100 yen for a 30-minute drying. Detergent is for free. Another laundry is also available in the next building. ✓Showers 24-hour available on each floor. 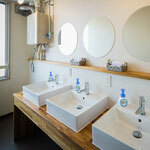 Shared shower rooms are equipped with body soap, shampoo and conditioner. ✓Toilets Shared restrooms with western-style toilets. A rear washing function is equipped. Available on each floor. 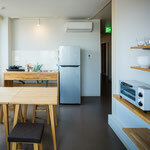 ✓Kitchen and dining space Each floor has a shared kitchen and dining space. A refrigerator, an Induction cooker, a wave, a toaster, a kettle, cookwares, table wares and seasonings etc. are equipped. ✓Coffee and Tea Instant coffee and tea bags are available for free. ✓Baggage storage Guests can leave luggage in the lobby on check-in date and check-out date during sightseeing. ✓Credit card We accept payments with MasterCard, Visa, JCB, American Express, Diners and Discover. ✓No curfew After checking in, you can enter with your code number. ✓No lock out You can stay in your room until check-out. ✓Roof Terrace Tables and chairs are equipped on the roof terrace. You can relax and enjoy beer with mountain views. Wi-Fi is available. ✓No Smoking No smoking inside the building. For smokers, the designated area is on the roof terrace. No elevators We don't have any elevators in the building. To go up to our reception (3F) and rooms (3F and 4F), please use stairs. We don't have TV in our hostel.